Innovative Resources’ cards can act as ‘conversational prompts’. That is, when used in conversations with other people, they can suggest pathways of communication that can effect change, not only in how we think about ourselves, but also in our relationships. We hope that anyone might obtain meaning and enjoyment from simply picking up the cards and using them to ponder their own feelings and thoughts regarding the choices they make and how they have shaped their personal identity. Equally, we would hope that teachers, youth workers, social workers, psychologists and others will discover opportunities to build our card sets into their therapeutic conversations. Strengths-based practice shares much in common with narrative and solution-focused approaches and with various models of intensive family services. These are the sources of many of the values and ideas that inspire the tools published by Innovative Resources. The materials that have grown out of these frameworks have been used by practitioners from different fields and organisations and with different theoretical frameworks. While the cards can be used by individuals in private, their ability to promote change is magnified when they are built into therapeutic or change-focused conversations. These conversations might be between friends or colleagues, a supervisor and staff or workers and their clients. These clients might be individuals, family groups or even organisations and community groups. Therapeutic conversations can never be scripted. They are intriguing and exciting due to the unlimited pathways these conversations can take. The use of strengths-based materials in therapeutic conversations allows for an intricate dance between the strategic use of questions and metaphors. 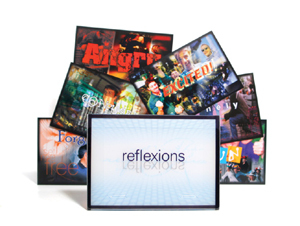 Reflexions fills a particular niche by providing a useful tool to enable young people to explore feelings and thoughts by themselves or in conversations with other people. The graphic style used is a techno design using digitally-enhanced photographic montages to create a contemporary feel. The graphics add meaning and richness to the concepts that identify a range of feelings and thoughts. How do these feelings and thoughts work for me as an individual? Do I enact them well? Do I do them in a safe and constructive manner? Am I in control of all these feelings and thoughts? Reflexions was designed as a tool for young people who, in the process of growth towards independence, are creating their own identities. Becoming an independent individual can be a difficult journey in our society. Dealing with the pressures of families, schools, peers, authorities and even the media is a difficult undertaking at a time when hormones are raging and there is a constant urge to experiment with all aspects of what life has to offer. For young people, Reflexions can work as a mirror that helps them to look at themselves from different angles and to see how others, such as parents, friends and teachers, see them. Reflexions can challenge the ‘images’ or ‘stories’, young people have developed about themselves. It can also be a reminder of how we actively create our own identities. We are not just the passive recipients of identities imposed on us by others. We can constantly make choices about how we want our life to be.